When New Jersey Senate President Stephen Sweeney announced he was in favor of excluding young workers from a minimum wage increase to $15 an hour, Make the Road New Jersey was already prepared to fight back. Youth member activists of the Make the Road – New Jersey rally for a $15 minimum wage. Photo Credit: Make the Road – New Jersey. Make the Road New Jersey’s base of activists is deep and experienced. The intergenerational membership had worked together in solidarity in past campaigns, including financial aid for DREAMers and drivers’ licenses for undocumented immigrants. When the members heard that youth carve outs to the minimum wage raise were on the table, they started planning and doing outreach to other young people. “This was a leadership development moment for a lot of the youth members. They really did lead the efforts throughout the campaign. They did the planning and outreach. Most of them do work and it was speaking to their personal experience,” says Craig Garcia, Make the Road’s director of worker organizing. 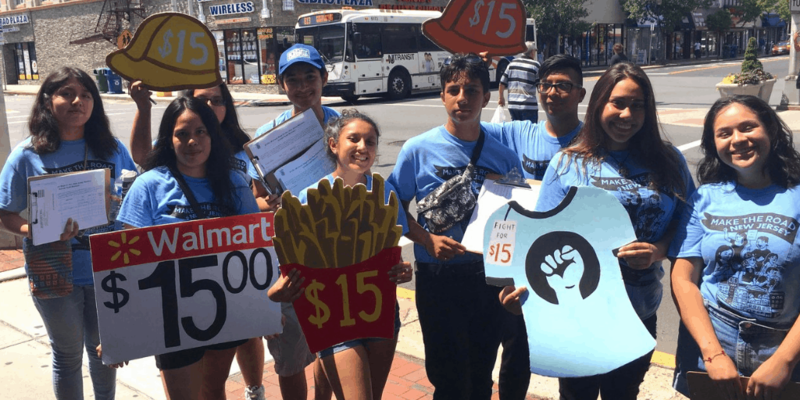 In one summer, they organized 150 working-class youth to talk to New Jersey voters and collected 6,000 petition signatures in support of a clean $15 minimum wage bill. They raised awareness through press events and by talking to thousands of people throughout the state. Through this robust organizing drive, many New Jersey voters learned about the unjust “youth carve out” effort that would pay young workers less than their older counterparts for doing the same work. NELP provided legal and policy support to help make the case for a clean $15 an hour minimum wage bill. Our report found that teen workers’ wages from working-class families in New Jersey make up 18 percent of the family income. “We are not working to pay for candy. We are working to help pay the bills and save for college,” wrote Make the Road youth activists Matthew Skolar and Maria del Cielo Mendez in a September 2018 Star-Ledger op-ed. Because many young workers support their families, any money they earn is vital, especially in expensive metropolitan areas across the state. “When you’re about to turn 18, most likely you’re graduating from high school and moving on to college and we have no way to pay for that, especially if you come from low-income families,” said Giovana Castaneda in an interview with FIOS1 local news. After months of hard work and intense organizing, New Jersey passed $15 and young workers were included. On February 4, 2019, New Jersey became the fourth state after California, New York, and Massachusetts to adopt a $15 minimum wage, thanks in large part to the visionary leadership of young members of Make the Road New Jersey. 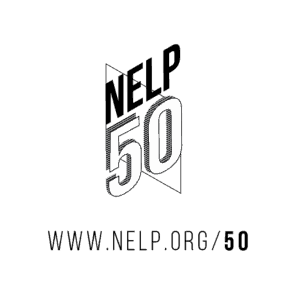 As we celebrate our 50th anniversary this year, we will continue to showcase NELP’s history with features from our staff, board, and partners; an interactive timeline; and opportunities for our supporters and allies to engage with us celebrating our history and creating a shared vision for our future.